Limited Edition: 300 copies Worldwide. The above Royal Mail Lest We Forget Miniature Sheet stamps were issued on 09 November 2006 by Royal Mail and feature the following stamp designs: 1st Poppy; 72p x 4 Country Pictorials. 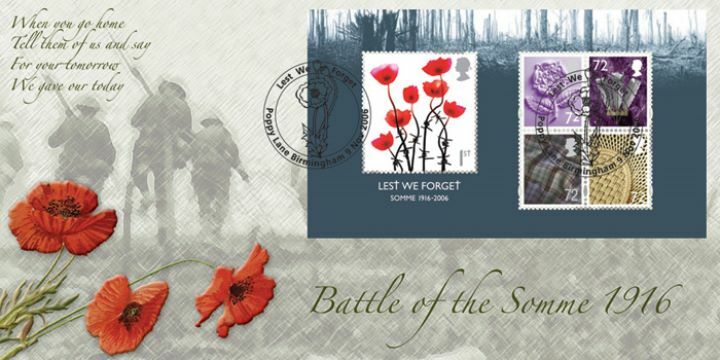 The Battle of the Somme first day cover with the Birmingham, Poppy Lane, Special Handstamp postmark has been produced by Bradbury and features these stamps which can make a very collectible and lovely gift.